I’m participating in a campaign on behalf of Mom Central Consulting for Sturm Foods, Inc. I received a promotional item and product samples as a thank you for bringing you this info. Most of you know me well enough by now to know that I LOVE my coffee. If you hadn’t already noticed, I’m even enjoying a steaming cup of Joe in my cartoon logo! It’s a crazy time of year and we’re all running around finishing (or starting) our holiday shopping on top of all the other stuff that busy families are up to right about now. Even if you’re always on the go, steal a few precious minutes and relax with a great cup of coffee you can make for yourself. 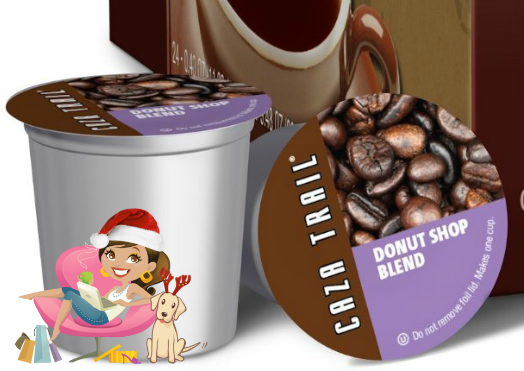 You can locate the Donut Shop blend and 24 other Caza Trail varieties on their Amazon page. Half OFF Interactive IQ Treat Ball Dog Toy $7.60 ($14.99 reg)! Dogs LOVE to work for treats and solve puzzles, too! This FUN ball keeps your dog mentally and physically stimulated because it’s not just a toy, it’s also a treat dispenser! It’s designed for Medium or Large dogs and I love it because you can adjust the difficulty level as your dog learns how it works. 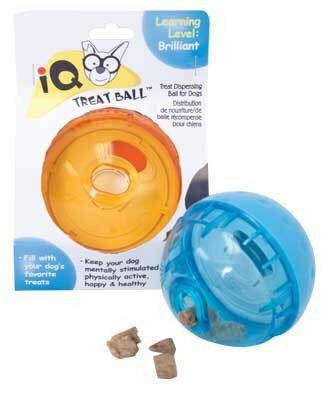 This interactive IQ Treat Ball Dog Toy is on sale right now for $7.60 ($14.99 reg) and is eligible for Free Super Saver or Prime Shipping at Amazon.com. Back to School Sale and Pet Deals at Only Natural Pet Store! Back to School time can be stressful for parents, kiddos and even your pets! Only Natural Pet Store is offering 10% off on products like Separation Anxiety Cures, Puzzle Toys, Chews and even Doggie Backpacks. So whether your fur kids stay home alone during the school year, or go off to Day Care, you can stock up and save on items to help keep them happy and occupied. Be sure to use the Only Natural Pet Store Promo Code BACK2SCHOOL and order by 8/31/12! Up To 50% Off Interactive and Puzzle Toys for Dogs & Cats from Kyjen, KONG, Chuckit! and More – Plus Free Shipping! Amazon.com has a bunch of Daisy’s favorite Interactive Puzzle Toys on Sale for 40-50% Off and most are also eligible for Free Super Saver Shipping and Free Amazon Prime 2-Day Shipping! Believe it or not, your pets can get bored just like humans do! 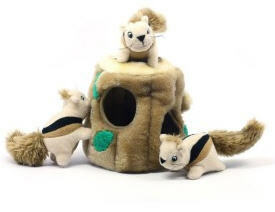 Interactive Toys are an important and fun tool for challenging your pet’s brain, keeping them busy and teaching skills such as problem solving and impulse control. Many of the puzzle toys are also useful for keeping pets distracted when you leave so they don’t get fixated on your departure…especially important for pets with separation anxiety! Check out these Amazon Top Selling Interactive and Puzzle Toys for Dogs and Cats at up to 50% Off! Learn more about How to get Free Shipping on just about anything at Amazon with this recent blog post!